Venture Academy Family of Schools is proud to offer a vast array of extracurricular academic based activities. Most of these activities and programs are provided with the help of outside organizations and the dedication of teachers and staff. Venture Academy competes as a member of the CCAA and has led all other schools within this League in overall team championships and runner-up finishes for the past 3 years in a row. The Mustangs athletic program was represented on "All League" teams across all sports with 43 student-athletes and 31 scholar athletes academically. Further information about the sports programs offered can be obtained by visiting the "Athletics" page on this web-site, or contacting the Athletic Director, Jim Sells at 209-227-2287 or jsells@sjcoe.net. The AVID program targets students in the academic middle–B, C, and even D students–who have the desire to go to college and the willingness to work hard. AVID places academically average students in advanced classes and provides them with an elective class that prepares them to succeed in rigorous curricula, enter mainstream activities in school, and increase their opportunities to enroll in four-year colleges. AVID's mission is to close the achievement gap by preparing all students for college readiness and success in a global society. The AVID program levels the playing field for minority, rural, low-income, and other students without a college-going tradition in their families (CDE, 2010). Venture Academy HOSA (Health Occupations Students of America) California chapter participated in State competitions and took the Bronze medal in the Medical Reading category beating 29 other teams in California and earning a spot to compete at the National HOSA competition in June 2012. The Heritage Festival strives to promote excellence among choirs, bands, and orchestras by providing the best opportunity for learning through seeing, experiencing, and interacting with other student performers and top music professionals. In 2008-09 the Foundations Show Choir was awarded 1st place in their division and received a Silver rating by judges. In 2009-10 the Show Choir was awarded a Gold rating, the highest award granted, and received a Silver rating by judges. Two students received the coveted Maestro Award for outstanding individual performance. 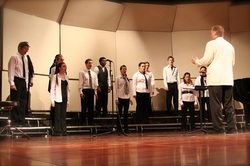 In 2010-2011 the Show Choir was awarded a Gold rating and the Concert Choir was awarded a Silver Rating. In 2011-12 the “On Pointe” dance team and “En Tune” show choir performed at Disneyland. Both teams were awarded a Gold rating. A growing body of studies presents compelling evidence connecting student learning in the arts to a wide spectrum of academic and social benefits. Research has shown that what students learn in the arts may help them to master other subjects, such as reading, math or history. Students who participate in visual and performing arts learning experiences often improve their achievement in other realms of learning and life. Students gain self-confidence and learn the values of teamwork and self-discipline. The rewards have been profound for current and previous students. The exposure to visual and performing arts incites passion and inspiration, and helps students strive for and reach their goals. California Coastal Cleanup Day is the premier volunteer event focused on the marine environment in the country. In 2009, more than 80,600 volunteers worked together to collect more than 1,300,000 pounds of trash and recyclables from our beaches, lakes, and waterways (California Coastal Commission, 2010). 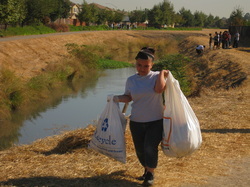 Students, parents and teachers volunteer their time to clean up a designated waterway in the Stockton area. In 2006, Venture Academy participated in its first Coastal Clean up day with 1 teacher and 9 students. 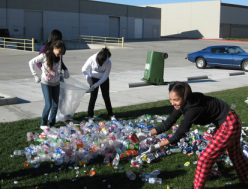 In 2009 and 2010 more than 60 students, staff and parents participated in the California Coastal Cleanup Day. In 2011 and 2012 more than 100 students, staff and parents participated in the yearly event. ECO Club is an afterschool program open to all Venture Academy Family of Schools students. The program focuses on reducing, reusing and recycling in our school community and the environment. At the inception of the program students placed recycling bins throughout the school and held events to promote recycling. During the school year students meet weekly to sort recycling and discuss ideas to reduce the schools environmental footprint on the world. The FARMS Leadership Program cultivates a meaningful connection between students and their environments by introducing them to environmentally sound agricultural practices that preserve land and resources for future generations. It places students in agricultural settings in their communities where they experience the relevance of basic environmental and agricultural sciences. The program gives high school students the tools to think critically about these issues. The FARMS Leadership Program was created to teach the next generation about the cause and effect relationship between agricultural practices and the environment, and to create connections with the land that our youth so desperately need. FARMS also introduces high school students to the resources and networks that can lead to careers in sustainable agriculture or related environmental sciences. The FARMS Leadership Program contributes to adolescent development by meeting the four competencies youth need to develop intellectually, emotionally and socially. Students attend monthly field days during which they work with — and learn from — a mix of farmers, ranchers, teachers, agricultural business owners, environmental professionals, academics and researchers in a curriculum tailored for their region. 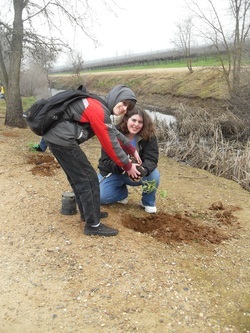 Students identify and complete a Community Action Project by the end of the school year. The FARMS curriculum presents agriculture as an activity within a defined environmental system. Students examine how agriculture affects the natural resources within that system, including the watershed, wildlife, vegetation, soil conditions, and air quality. Students are encouraged to carefully consider the cultural and social needs that drive agricultural practices, and the consequences of specific choices in food production. The curriculum encourages students to understand the concept of environmental equilibrium. FARMS graduates learn the skills to think and act differently. As they become adults, they're better prepared to make critical choices and decisions. FARMS graduates are encouraged to continue their studies in college. They have toured campuses, met professors and instructors, spoken individually with farmers and agricultural business people, and learned about internships, work-study and summer jobs. FARMS graduates learn to express themselves, speak out, take charge, and work cooperatively with people who are different from themselves. For most FARMS participants, this is the first time they have had an extended, cooperative relationship with contemporaries not from their own background (Center for land-based learning, 2010). Each year, the Constitutional Rights Foundation creates and produces a new set of Mock Trial materials based on an important issue facing America's youth. The materials include a hypothetical criminal case (including summaries of case law, witness statements, official exhibits, and simplified rules of evidence); lesson plans on the central issues in the case; and competition rules and guidelines. Cases are released to all California counties in the early fall. Typically, a county competition occurs in late fall or early spring, with anywhere from two to six rounds of trials. The winners of the county competitions go on to the State Finals in March. In 2008-09, VAFS won the San Joaquin County Mock Trial Competition for the first time and placed 25th at the State Finals. In 2009-10, the Mock Trial team won the San Joaquin County Mock Trial Competition again and went on to compete in the State Finals placing 25th out of 42 teams. In 2010-11, the team placed 2nd in the San Joaquin County Mock Trail Competition. In 2011-12, the team won the San Joaquin County Mock Trial Competition and placed 8th in the State Finals out of 32 teams. An 11th grade student from Venture's Foundations Academy won 1st place in the courtroom artist competition. A 12th grade student from Venture's Durham Ferry site won the top witness award for her part as the detective in the case. 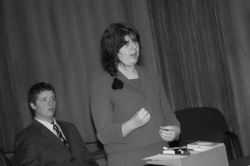 The Mock Trial program allows students to develop the skills necessary for the mastery of state content standards for history and social science. Through performance-based education, the program furthers an understanding of both the content and processes of our legal system; increases basic skills, analytical ability, and self-confidence; and promotes cooperation among students of various cultures and interests. By studying the case and preparing strategies and arguments for trial, students also develop presentation skills, and gain an understanding of their obligations and responsibilities as participating members of our society. 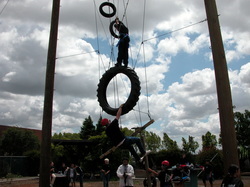 The Venture On Challenge Course is part of the Venture Academy Family of Schools program. The course serves students and staff from school districts, as well as professional and other groups from the area and around the state. The challenge course is a series of individual and group physical challenges that require a combination of teamwork skills and individual commitment. The course ranges from ground level games and initiatives to high-level elements constructed of utility poles, rope and cables. During the school year, students have the opportunity to train with the instructor and learn belaying. Students learn belaying methods, safety and communication. At the end of the course students are able to volunteer to work as belayers during challenge course events throughout the year. Increase the participants sense of personal confidence. Increase mutual support within a group. Improve skills in communication, decision making, and problem solving. Develop an increased level of agility and physical coordination. Develop an increased joy in one's self and in being with others. Have fun, relaxation, and play. WildLink's mission is to give underserved teens a series of wilderness- and home-based experiences that will empower them to better their own lives as well as their communities; and to ensure that the diverse California citizenry is informed, invested and committed to the enduring resource of Wilderness. WildLink is an innovative partnership between the Yosemite Institute, Yosemite and Sequoia-Kings Canyon National Parks, the Sierra Nevada Wilderness Education Project, the Sequoia Natural History Association and the National Forests of the Sierra. Since 2000, the WildLink Program has worked to open Sierra wilderness to the multi-cultural population living at its doorstep and demonstrate the relevance and benefits of Wilderness and public lands to all Americans. 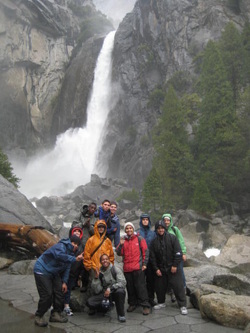 WildLink Expeditions give students the opportunity to experience wilderness firsthand. Since August 2000, an average of 100 students per year have discovered the wisdom of the Sierra Nevada. Students are chosen from a total of 13 high schools. Each expedition includes a 5- day backpacking trip into the Sierra Nevada wilderness. Students explore their place in the wilderness; how their actions impact our environment; the growing field of watershed management; environmental science through hands-on research projects; the cultural history of Yosemite and Sequoia-Kings Canyon National Parks and their surrounding areas; geographical history; natural history; and possibilities for all of our futures. Students will learn what they can do as individuals, strictly through their own ingenuity and physical achievements. They will meet other students from different social and cultural backgrounds and will learn to work together to confront the social, philosophical and physical challenges of wilderness (WildLink, 2010).